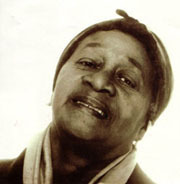 I met Beryl Gilroy in 1996 at a Caribbean Women Writer’s conference in Miami. I had no idea who she was, even though I had read The Boy Sandwich as a girl. I was in the corridor waiting for another session to start, and she was sitting on a chair in the corridor waiting for someone to come get her. I smiled at her and said hello, and she asked me to come sit by her. We were chatting for about 15 minutes before I realised she was THE Beryl Gilroy. Then I nearly fell on my face, but she put me at ease. She encouraged me to keep writing and to keep working at it. She took my address and telephone number and about six weeks after the conference I got a copy of every book she’d ever written. We corresponded for a time, but I guess her age and illnesses precluded our discussions by letter. About five years later she died, but I have never forgotten her.